17a. [Comedian cultivates flowers? ], ROCK GARDENS. Chris Rock. 23a. [Poet inks a contract? ], POUND SIGNS. Ezra Pound. 33a. [Opera singer scrawls graffiti? ], PRICE TAGS. Leontyne Price. Not sure if that kind of “tagging” wants an object, grammatically. This one made me smile, though. 48a. [Actress stumbles? ], FIELD TRIPS. Sally Field. 53a. [Philosopher removes his clothes? ], BACON STRIPS. Wait, not Kevin Bacon? Who wants to see Francis Bacon naked? 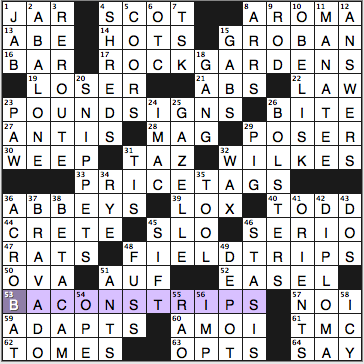 I had enough crossings to fill in BACON without really reading the clue and I was picturing the actor. I like that the theme set is 40% women and 40% African-Americans. Highlights in the fill: OBELISK, MANATEE, GROBAN, BOLSTERS in the east; ACROBAT, BRAVADO, SNIPPETS in the west. Graceful GAZELLE in the middle. Clunkiest bits: Plural abbreviation ARRS, SLO, A MOI, maybe OPE and RAO. Nothing deadly. 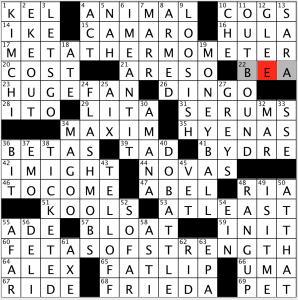 And the fill is very low in crossword repeaters made of super-common letters—your ERA ALA ERIE ARIA AREA type stuff that can dry a puzzle out. Anyone else slow themselves down in the lower left by filling in BETAMAX instead of the less-familiar BETACAM? That nudged me towards TEXTS in place of TOMES, oof. Nicely done. And with only three theme entries, the fill is solid. I don’t know how you feel about partials or phrases, but I don’t mind them. 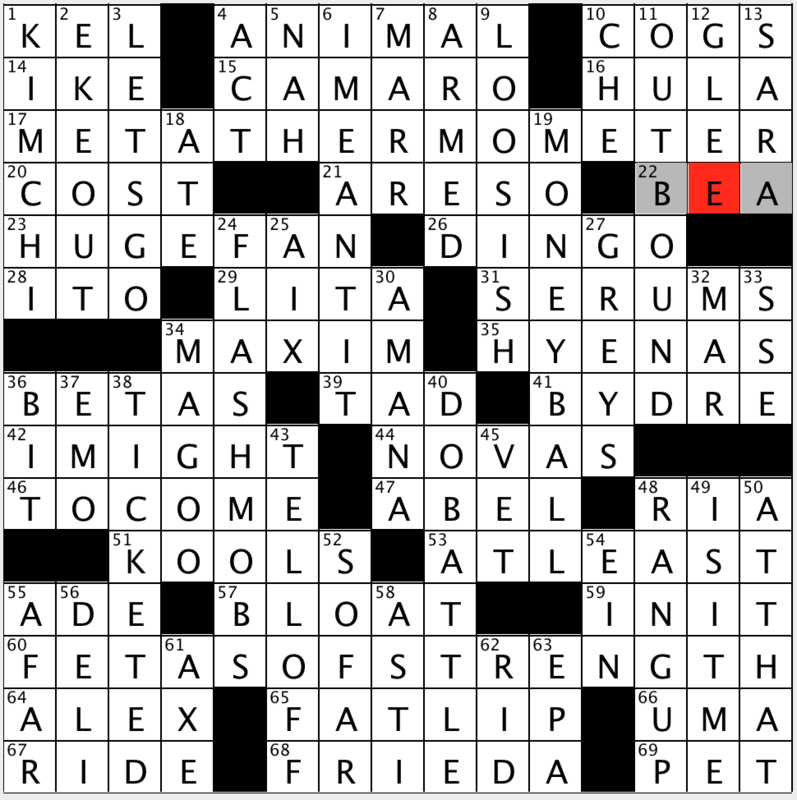 They can make a puzzle seem fresh when there are those that you use often, but don’t often see in puzzles. This puzzle seemed to have a lot to me. But that isn’t a complaint; it, to me, shows Matt’s skill as a constructor. They all seem to flow naturally. This puzzle contains ARE SO, HUGE FAN, I MIGHT, TO COME, AT LEAST, FAT LIP, EKE OUT, LET’S GO, I MEANT IT, FLASH MOBS, DO BATTLE, TELL OFF, RANG UP, IS IT ME?, AT THAT, and SO FAR. Did I miss any? Again, other than EKE, I don’t consider any of these “trite” or, to borrow Amy’s phrase again, Scowl-O-Meter worthy. The only entry I was totally unfamiliar with was 7D [Ex-Smiths guitarist Johnny] MARR. I didn’t have to look it up, but I don’t know him at all. Am I the only one who learned him from this puzzle? After all that, I still rate this at 4 stars. Solid once again! 18A [Website for handmade goods] ETSY – I’m not crafty, but I have seen this quite a lot in crosswords since its inception in 2005. 49A [“The Family Circle” cartoonist Bil] KEANE – Got this one quickly, thanks to many years of comic strip consumption. I especially liked his Sunday comics where it showed one of the kid’s path through the yard or the house and all the mischief that they got into. He passed away in 2011, and his son Jeff draws the cartoon now, I believe. 6D [Freakish] OUTRE – First of several French down entries. Or derived from the French. This is not too common a word, but a little more common in puzzles. I, for one, like it. 9D [Pierre’s “And there you have it!”] ET VOILA – More Français! I like this entry, too. 10D [Mali currency] FRANC – I nice clue to not make you realize there are quite a few French entries! 34D [Fanny] DUFF – I am familiar with the pastry chef Duff Goldman. Where we live he markets some gourmet ice cream flavors. Yum!! 35D [Hoover rival] ORECK – Are these still popular? I haven’t seen an Oreck store or a QVC promo for them in years. 44D [Cable station for game highlights] ESPNEWS – As big of a sports fan that I am, I rarely watch this channel. But it is practically 24 hour sports highlights. I didn’t say I NEVER watch it…! 53D [Flashy display] ECLAT – Another French term. All of them are actually good. All common enough to not present too hard of a challenge. 54D [Self-pitying lament] WHY ME? – Love this entry! Very nicely done. Hopefully I will get to meet C.C. someday soon. I have done a few of her puzzles now, and I like her style. 3.5 stars! The “special ops” of title does not refer to the military’s special forces, but tips us off to the gimmick in the themers. Here, one word ending in “-IP”—in each of the four very lively, in-the-language two-word base-phrases [a mouthful—sorry! 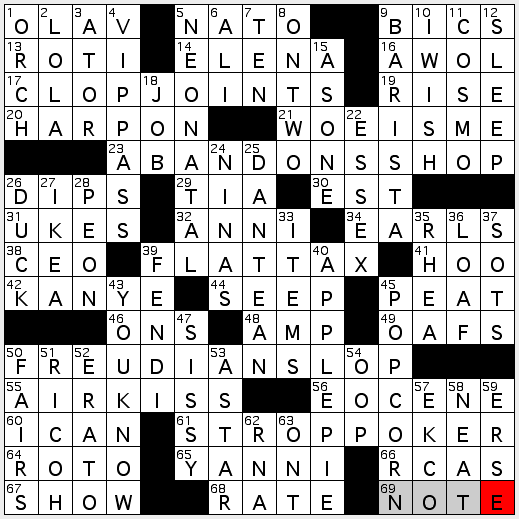 ]—receives a makeover, and now ends in “-OP.” Additionally, the meaning of the base phrase is referenced in the clue—which leads not only to that cryptic-like, punny cluing I mentioned, but makes the resulting fill wickedly groan-inducing as well. These are some very “special -OPS” indeed. 17A. CLOP JOINTS [Shady places for horses?]. No, not THE STABLES. Clip joints are places where “shady” deals may be taking place. Horses go clip-clop. See how this works? 23A. ABANDONS SHOP [Quits minding the store? ], instead of hastily removing oneself from a sailing vessel (ship –> shop…). 50A. FREUDIAN SLOP [Unintentional mess caused by a psychoanalyst]. If s/he does slip up so egregiously, find yourself another therapist! 61A. STROP POKER [High stakes game for barbers?]. Now that’s just a thing of beauty. High concept and highly successful in the process. The substitution concept is a mainstay of wordplay puzzles. So it’s all about the execution. Looking at this set of base phrases and themers, I’d say today’s example is right up there at the top. And the puzzle’s additional assets don’t hurt none either, “YOU KNOW?” [“Get what I’m saying?”]. Final likes? The un-musical HARP ON [Belabor] (though I love this as an imperative to a stringed-instrument-playing Garth…); the literal [Years in ancient Rome] for ANNI and the twisty [Totally off base?] for AWOL; the non-attire-holding [Band box?] for AMP; and the wistful [“Wouldn’t that be nice”] for “I WISH.” And while I’m not deeply keen for either EOCENE [Mammalian epoch] or Pliocene-epoch OOP [Alley from Moo] (check out those character names and wow—had no idea this strip first appeared in the 1930s…), I like that these prehistoric timeline markers cross each other. Here’s to a safe and glorious 4th! And all of a sudden, half the year is officially done! 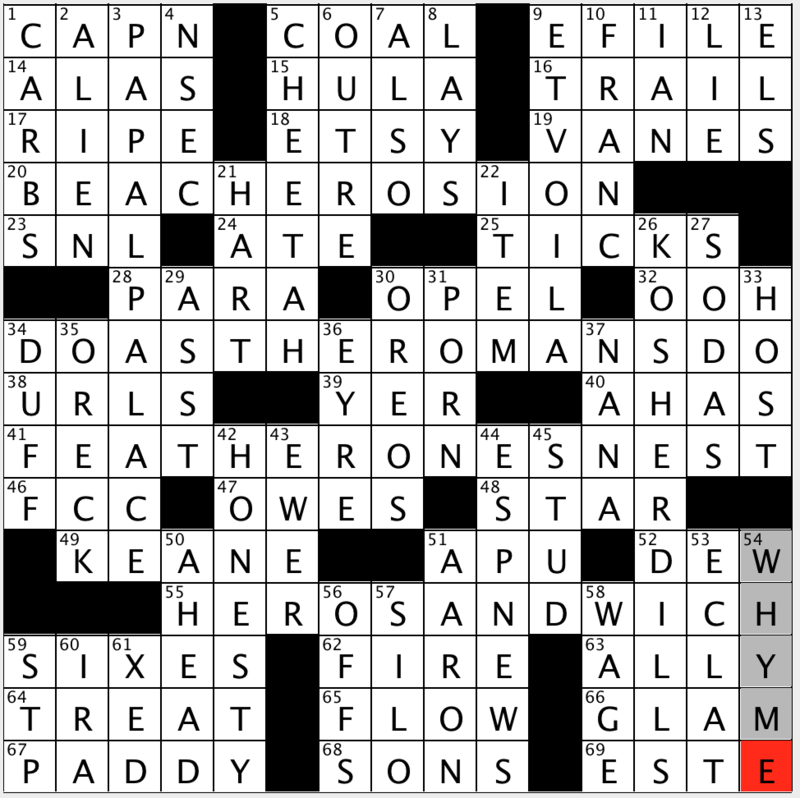 Hope you’re doing well, crossword lovers, and hope you had some fun (and games) with today’s crossword, brought to us by Mr. Jeff Chen. In it, each of the first three theme answers ended with words that are also the names of fictional/animated birds. 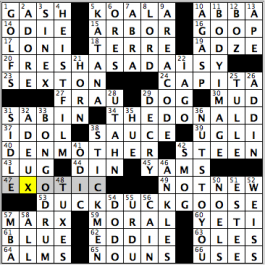 The connection between those first three answers is tied together with the final theme answer, DUCK, DUCK, GOOSE (53A: [Children’s game hinted at by the ends of 20-, 34- and 40-Across]). Number of times I’ve played duck, duck, goose in my lifetime? Zero. I know, I know…I didn’t have fun as a child at all! “Sports will make you smarter” moment of the day: WEISS (52D: [Name replaced by “Houdini”]) – Former Major League shortstop Walt WEISS is the current manager of the Colorado Rockies. As a member of the Oakland Athletics, Weiss won the American League Rookie of the Year award in 1988, becoming the third consecutive A’s player to win the award. Weiss made his one and only All-Star Game appearance in 1998, as a member of the Atlanta Braves. Have a great day, and I’ll see you in July! This entry was posted in Daily Puzzles and tagged C.C. Burnikel, Elizabeth C. Gorski, Jeff Chen, Matt Jones, Susan Gelfand. Bookmark the permalink. How about the fact that 20% of the theme are Fascist anti-semites? As a woman I understand some of your sentiments but puzzles are meant to entertain. I enjoyed your Kevin Bacon image. @Stephanie, I’m going to reprint your comment, frame it, hang it and read it everyday. Hey there, after finally getting internet back, I read that Mr. klahn had an accident and that he himself stated so in the comments. Wish I could’ve read the comments that day. Please get well soon. CN – I’m a little surprised that 47d Wimp – SISSY didn’t attract any attention. It caused me to stop. I don’t recall that usage of the word ever being anything but hurtful. As a stand-in for sister it’s perfectly fine.